Veterinarians, laboratory technicians and assistant veterinarians from Ethiopia who were trained on field postmortem examination and sample collection in small ruminants (photo credit: ILRI/Hiwot Desta). Studies in 2015 and 2016 identified respiratory and reproductive diseases as key constraints in small ruminant production in Ethiopia. One of the aims of the livestock health flagship of the CGIAR Research Program on Livestock is to develop herd health packages which combine disease prevention and control with improved husbandry to reduce the occurrence and impact of these diseases. However, little is still understood on which pathogens contribute how much to production losses and contribute to risk of exposure to zoonotic diseases. Therefore, an important part of the research is to conduct systematic postmortem examination combined with laboratory investigations based on histopathology, serology, bacteriology and molecular analysis to confirm and take more targeted measures for the identified diseases and potentially inform research on vaccines and diagnostic tools. 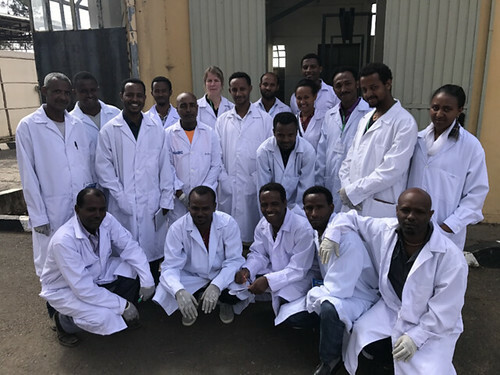 To this end, on 6–8 February 2017, scientists from the International Livestock Research Institute (ILRI) in collaboration with the Swedish University of Agricultural Sciences (SLU) and Ethiopia’s National Animal Health Diagnostic and Investigation Center (NAHDIC) organized a training course for 16 veterinarians, laboratory technicians and assistant veterinarians working in government research centers and agricultural offices. The trainees also conduct field work in study sites of the CGIAR Research Program on Livestock. 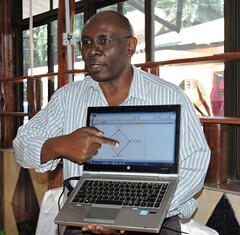 systematically document data and report the findings. In a practical session where trainees worked in groups of four, they practised basic clinical examination, starting with history taking, restraining of the animal and general physical examination, through to clinical examination and sample collection in live animals. After demonstrations by Ulrika Koenig (small ruminant specialist at SLU) and Nathnael Teshager (pathologist at NAHDIC), the groups examined individual organs and learned how to differentiate between normal and abnormal organs. They found various abnormalities in the postmortem examinations, including liver fluke, lungworm, pneumonic lung, rumen fluke and white spots on liver. The trainers guided the trainees in collecting samples for histopathological, microbiological and molecular analysis. Finally, each group presented a brief report on the findings of the postmortem examination and related these to the antemortem examination findings. The trainees are now well equipped to apply the acquired skills in the field as they carry out interventions to tackle respiratory and reproductive diseases of small ruminants. This is an important contribution towards improved understanding of the underlying causes of poor productivity in small ruminants in Ethiopia. This activity marked the launch of active involvement by SLU in small ruminant respiratory and reproductive disease control in Ethiopia. The team looks forward to supporting field work soon. 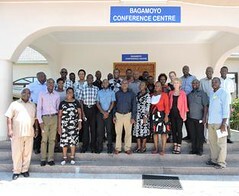 The training was funded by the CGIAR Research Program on Livestock and the International Fund for Agricultural Development (IFAD)-funded Small Ruminant Value Chain Transformation (SmaRT) project.